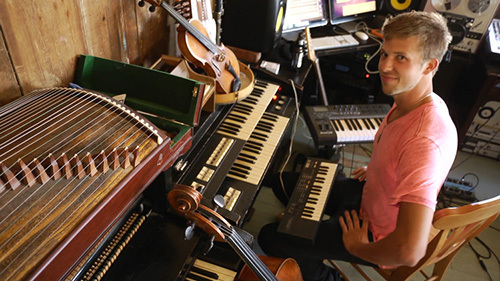 William is a composer, multi-instrumentalist and producer based in the San Francisco Bay Area. He has scored and contributed music to numerous critically-acclaimed narrative and documentary films (e.g. the Independent Spirit award winning The Waiting Room, and Cannes Cinéfondation prize winning Skunk) . His music has been featured in television shows and miniseries for CBS, IFC, Showtime, Discovery, AMC, AXS TV, Al Jazeera and PBS as well as for numerous dance and theatre productions, art installations and in national ad campaigns and PSA's. In addition to his commissioned multimedia work, he has a very active recording career, releasing numerous Psych-Folk, Contemporary Classical, and Experimental recordings under his own name and under the moniker Vieo Abiungo. His distinct, organic sound is the product of his unique talents as an instrumentalist and recordist, utilizing a vast and varied arsenal of live, acoustic instrumentation to fully realize his compositions as a solo endeavor.